Gordon Laird is the author of three books, including The Price of a Bargain: The Quest for Cheap and the Death of Globalization (2009). In May on the University of Alberta campus, and a crowd is gathering inside the soaring, glass-walled atrium of the seven-storey Katz Group-Rexall Centre for Pharmacy and Health Research. With most students already gone for the summer, it’s not a flash mob or an outlawed hazing ritual, and anyway these people are too old and too well dressed. And the Tim Hortons kiosk isn’t giving away free coffee, although that would be nice. Looking closer, there are telltale signs: nervous-looking executive assistants with clipboards and Day-Timers; press secretaries giving out folders of PR materials; a line of photographers poised in front of a portable podium; several groups of people in business attire, chatting or fondling their BlackBerrys. Really, it can only be one thing—a rare and special thing for any university in 2010. Some arm of government is giving out an enormous amount of money. Introductions are made, a federal minister delivers a prepared statement, and someone else says a few words. Then Indira Samarasekera, the president of the University of Alberta, takes the podium, and the whole atrium brightens, if only slightly. She is glowing, and why wouldn’t she be? Today she gets to claim a $40-million jackpot from the federal government’s new Canada Excellence Research Chairs (CERC) initiative, a $190-million recruitment drive to lure nineteen of the world’s leading science and technology researchers to Canadian universities for at least the next seven years. It is one of the biggest-ever attempts to launch Canada into the major leagues of science. “This is a fantastic day for Canada,” she says with unrehearsed glee, “and the University of Alberta in particular.” U of A managed to get twice as many research chairs—and twice as much money—as any other university in Canada, doubling the University of Toronto’s haul, and leaving far behind its rival to the south, the University of Calgary, which received nothing. To those who know Samarasekera, this victory comes as no surprise. While U of T still dominates Canadian universities in fundraising for research, U of A is the fastest growing of the nation’s top five schools. Since becoming the university’s first female president in 2005, she has made it clear that it will not settle for being among the best in Canada; her goal is to make it one of the top twenty public universities in the world by 2020. The CERC results reflect these global ambitions, as do the construction cranes scattered around the campus. In recent years, U of A has raised $1.4 billion for several major projects, which has already helped it improve its international rankings and solicit additional research funding. All this despite the harsh realities of the global recession. Thanks to investment losses and provincial funding freezes, the university posted a deficit of $8.2 million in 2008 and a record $60.5 million in 2009, and it projects one of $14.8 million for 2011. The Katz centre remains unfinished, as do several other nearby buildings, including the Mazankowski Alberta Heart Institute, either because of the university’s deficit, or because no research funding yet exists to populate them. The university is betting on its ability to fill the space with gainful projects sometime in the future. In the meantime, Samarasekera’s goal for U of A to become “Top 20 by 2020” remains very much on hold. The university will see across-the-board cutbacks of 5 percent in all departments next year, and even the president and the senior administration have taken “furlough” days (unpaid days off meant to cut costs). Undergraduate class sizes are growing as contract instructors are laid off. Student food bank usage has increased an estimated 20 percent in the past year, thanks to tuition hikes and rising living costs. When the Edmonton Journal reported in June that the university was expected to lose at least 400 staff and faculty to layoffs and early retirements before the year’s end, the university’s administrators objected, suggesting that the figure would be closer to 250. Later, back in her office, a sweeping half-oval room lined with oak and windows, she explains why Canadians need to look beyond a few unpleasant years of recession. Like it or not, Canada is now part of a twenty-first-century version of the arms race: instead of amassing missiles, countries are now outbidding one another for smart people, lavishing millions on high-tech facilities and granting programs designed to drive innovation. France has already built much of its $5.9-billion (US) super-university, China is mere months away from the world supercomputing record; and the United States, despite its troubles, still claims the highest number of top-rated universities on the planet. In a single generation, she says, South Korea went from having one of the lowest GDPs to one of the highest in the world—“and it was [because of] significant investments in education and entrepreneurship.” By comparison, Canada’s $190-million splurge on a global headhunting mission, in which half of the prize researchers were lured away from the United States, may not be enough to make us competitive with nations that are investing billions more, and that equate future prosperity with advances in education, science, and technology. Universities are responding to this new reality in two ways. On the one hand, they are reinventing themselves as agents of change in a world clamouring for solutions. Indeed, we cannot cure cancer, respond to global warming, or even maintain our current standard of living without thinkers, researchers, trained professionals, and educated citizens. On the other hand, universities are increasingly defined by the commercial forces around them, including governments that actively reward growth-friendly research and scholarship. University campuses are therefore becoming communities of academic haves and have-nots, the various disciplines divided by their perceived contributions to GDP and their capacity to attract funding. The result isn’t just classrooms named for corporate benefactors, which is old news, but a narrowing of society’s field of inquiry. A pay-per-view style of sponsored research gives those who have the money the power to determine the questions being asked, and sometimes to profit from the answers as well. So it isn’t surprising that views about Samarasekera diverge. Depending on whom you ask, she is either Canada’s bright future, or a threat to all that is sacred and good about higher education. ndira Samarasekera has been bridging worlds since she was a child. She was born in 1952 into a Tamil family in Sri Lanka, though her earliest memories are not of Ceylon, as it was then called, but of England. When she was three, her father, a surgeon, took his young family to the United Kingdom for a period of post-graduate work. Consequently, her early impressions were very different from those of her peers back home: ballet, English gardens, very proper schooling, and the full gamut of Western technology, including television. But with this worldliness came challenges. Returning home three years later, she had to become trilingual in order to reintegrate into post-colonial Sri Lanka’s complex and divided society. At about this time, Sri Lanka passed laws making it more difficult for Tamils to enter university and find public employment. That, she says, was when “young Tamils began to mobilize around the notion of having to fight for their rights and for their independence—which to me was writing on the wall.” An early incarnation of the Tamil Tigers had emerged in the early 1970s, and they were already experimenting with bombings and other tactics that would help define modern terrorism. Samarasekera loves her country—she still returns at least once every three years—but she knew she had to leave. After a brief stint as a maintenance engineer at a Shell oil refinery (“It was very boring”), she was awarded a Fulbright scholarship. “So I got married at age twenty-three to a fellow mechanical engineer, and we came to the United States.” To the University of California at Davis, to be precise, and then on to the University of British Columbia for her doctorate. Along the way, she had two children, one of whom grew up to study law, and the other, medicine. She became a Canadian citizen in 1980, amid a challenging period of balancing her young family and a demanding career. At one point, she was on the brink of quitting her doctorate studies, until her thesis adviser pulled her aside. “You have no right to do that,” he said. “You have been given all these talents. Don’t waste that.” Upon graduation, she could only find a temporary teaching contract at UBC, but in time it led to a tenure track position, and she became only the second woman appointed to the university’s engineering faculty. Her marriage eventually failed, but her career thrived: she went on to have a major influence on the international steel industry, using mathematical models to predict and correct subtle defects, which facilitated major advances in quality and efficiency. After twenty years, the list of consultancies, grants, and publications on her CV is eleven single-spaced pages long. She guesses that she has visited more than 100 steel plants around the world, including one in Alberta with no women’s washroom. 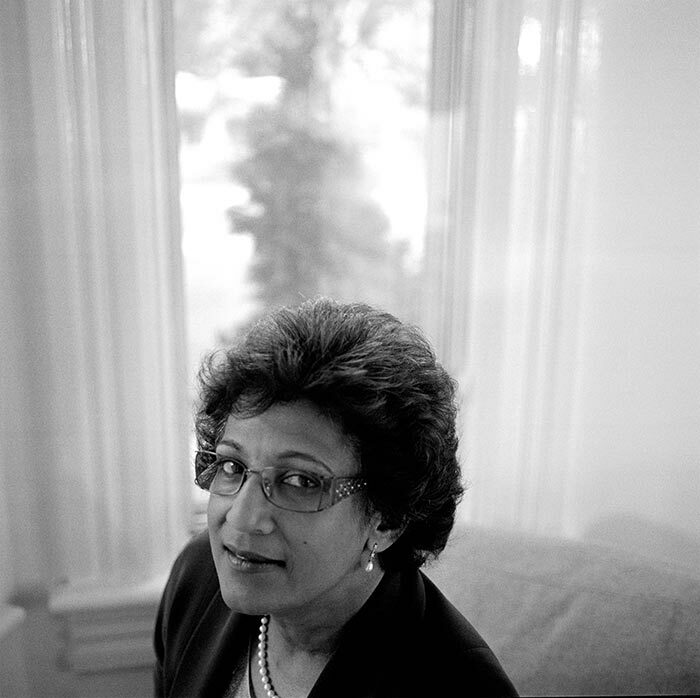 Some observers saw Samarasekera’s appointment in 2000 as UBC’s vice-president of research as unusual and perhaps risky. Most university leaders work their way up to the executive office, putting in time as department chairs, deans, and provosts, whereas in one big step she was elevated to one of the university’s most critical jobs, responsible for a significant amount of its annual revenue, all of its research, and much of its reputation. “I knew that the university could do a much better job in supporting researchers to succeed at getting grants, at transferring their knowledge to industry, and at promoting their knowledge to the public,” she says. “That was my motivation. I had zero desire or intention to be a university president.” Within four years, UBC’s research funding from government, private donors, and industry more than doubled, bumping from $149 million in to $377 million. That’s when other universities started calling. In the course of a day, Samarasekera might ponder lab safety design, meet with a federal minister, grapple with the possibility of a double-dip recession, and study up on the future of nanotechnology. She must manage several different levels of government, as well as myriad granting agencies, professional organizations, and corporate partnerships, plus donors large and small. And she stays in constant contact with her executive team: six people, including herself, who earned a total of $3.6 million in salary and benefits in 2009. (Maclean’s has called Samarasekera, whose 2009 compensation including non-cash benefits was $830,000, one of Canada’s highest-paid university administrators.) Her provost, Carl Amrhein, with whom she discusses hiring, firing, research, and academic performance, actually runs most of the day-to-day aspects of university life. Lately, Samarasekera has been spending time on the university’s international strategy. Like many private sector corporations, U of A believes part of its future lies in emerging markets, especially China, Mexico, India, and Africa. Canadian universities depend primarily on provincial funding for undergraduate programs, but money for research and capital projects must be accessed elsewhere—which explains, in part, why Samarasekera spends about 110 days a year on the road, apparently to good effect. In April, the university announced an $80.5-million gift for virology research, sponsored by the Hong Kong billionaire and philanthropist Li Ka-shing and the government of Alberta. (It was one of the largest such gifts in Canadian history.) “She has an incredible profile in Canada,” says Suzanne Fortier, president of the Natural Sciences and Engineering Research Council of Canada, one of the country’s largest agencies for research grants. “But she also has a really good profile internationally. I’m often meeting people outside of Canada, and there’s one name that comes up often, and it’s Indira.” In 2009, Samarasekera was invited to the annual Bilderberg conference, joining David Rockefeller, Queen Sofia of Spain, and 120 or so others representing the likes of the World Trade Organization, Goldman Sachs, and Royal Dutch Shell—confirmation, if any were needed, that she had made the global A-list. What makes her so popular with politicians and CEOs is her belief in the knowledge economy—the idea that the strength of a society and its economy are largely informed by the quality of its education systems. It doesn’t matter that it’s already a bit of a cliché. Politicians have come to associate economic growth—or at least gains in health, productivity, efficiency, and sustainability—with education, and creating what Fortier calls knowledge “assets.” The private sector, too, views the talent and research created by top-level universities as critical. Canada’s steadily declining productivity, now well below that of the United States, suggests that we can no longer create significant prosperity, as we did in decades past, through debt-fuelled consumer spending and natural resource exports. Everyone now agrees: the answer is education. Samarasekera concedes there are imbalances, possibly serious ones. There is an opportunity, she believes, “for universities to do research that currently doesn’t look even remotely commercially viable,” she says. “I’m going to ask the prime minister to invest in knowledge that may or may not have a commercial breakthrough tomorrow, even in ten years or ever, because you just don’t know where it could lead.” The irony, of course, is that the Harper government, which often reminds us that politicians are bad at engineering social and economic change, should need to be persuaded that they are no better at predicting what knowledge will ultimately prove useful. As an engineer, Samarasekera knows there are problems to be fixed and that universities should play a role, but as a researcher she also knows that Canada’s history in choosing economic favourites—from coal mining to shipbuilding—is rife with failure. This is the double bind in which all Canadian university presidents now find themselves. Everyone agrees that higher education could and should help us solve problems. But when resources are scarce and funders designate “priority areas,” whose problems get solved first? At the administrative level, Eric Newell, former chairman and CEO of Syncrude, served as the university’s chancellor and as chair of its board of governors. Tim Hearn, former chairman and CEO of Imperial Oil (also part owner of Syncrude), was a co-chair of U of A’s 2008 fundraising campaign, working with Samarasekera to exceed its goals. Prominent among funders has been the industry itself: the oil patch accounted for an estimated $50 million in donations between 2002 and 2008. Samarasekera knew the honeymoon was over when the posters started going up. Last October, a group named the Samarasekera Response Team covered the U of A campus with slogans such as “WOMEN: STOP! DROP! MEN: ENROLL!” and “STOP THE FEMIMENACE” and “WOMEN ARE ATTACKING CAMPUS!” Several days earlier, in an interview with the Edmonton Journal, she had mentioned declining male enrolment, glibly stating, “I’m going to be an advocate for young white men, because I can be. No one is going to question me when I say we have a problem.” The Samarasekera Response Team took issue with her apparent lack of concern for the under-representation of women and minorities in many faculties, particularly at higher pay grades. The posters made national news, and not only because Samarasekera had opinions about the boy crisis in education (a big deal in a province that has the lowest levels of university and college participation in Canada). It was news because campus security rounded up the Samarasekera Response Team, and, as team member Derek Warwick tells it, threatened them with disciplinary action under the university’s student behaviour code, which meant possible suspension or expulsion. They were told “we weren’t ever to post posters on campus again,” he says. The original idea was to do something “fun and political,” says Warwick, although for some of the others it was more than an attention-getting ploy. Student expenses had been rising for years, including annual, incremental increases in tuition fees and the introduction of a new non-instructional fee of $290 for such amenities as common student space, sustainability and services. Many saw the new fees as a cash grab at time when the university appeared to have money to build new buildings, pay its president $830,000 a year, and take out expensive ads in the New York Times to raise its profile. Morale within the professorate is declining, especially in the humanities. When Samarasekera took office in 2005, Canada was already allocating most of its money to the sciences and engineering, even though 58 percent of students were actually studying arts and the humanities. She said at the time that she would lobby the federal government to increase funding for the main arts granting agency, the Social Sciences and Humanities Research Council, but in 2008–09 it disbursed $323 million, compared with the roughly $1 billion disbursed by the Natural Sciences and Engineering Research Council. While it is true that it costs more to teach science than social science and the humanities, owing to equipment and infrastructure costs, the problem is systemic and highly visible. At the University of Alberta, new buildings tend to go to engineering, medicine, and the sciences. When the arts and humanities get new space, it is usually second-hand, albeit decently refurbished. There was talk of a provincial endowment fund specifically for the arts, but this has not come to pass. Gurston Dacks, professor emeritus of political science, sees the divide between arts and sciences as ultimately self-defeating, as many of our biggest challenges, from obesity to energy consumption, pertain not to science, per se, but to human behaviour, culture, and society. “You can get cleaner tar sands, but that’s not really going to address our energy demand problem,” he says. “All of these solutions lie on the humanities and the arts side of the campus.” Gordon Laxer, director of the university’s Parkland Institute, complains that Alberta’s focus on its energy sector has meant that its economy hasn’t significantly diversified. “What knowledge-based industries in Alberta have to be here? ” he asks. “Alberta is less diverse than ever: we’re about oil and gas, forestry, farming, and tourism.” Public funding of energy research is increasing, he notes, even though private research spending as a percentage of revenue is five times lower in that sector than the Canadian industry average. In a few days, Samarasekera leaves for Ottawa to join eleven other university presidents in a meeting with Stephen Harper. Her chief of staff, executive officer, speechwriter, and a few other insiders converge around the large oval table in her office to go over the arrangements. It plays out like an episode of The West Wing, except the people here are more polite, and the foreign land they are visiting is Ottawa, its king a fellow Albertan. Ruth Kaplan (ruthkaplanphoto.com) has exhibited her work in Italy, France and Guatemala.Bathers is her first monograph.